Helping to connect fans for over four decades as part of a national, and global, network, Starfleet Command Quadrant 2 is a diverse and eclectic collective of Star Trek and science fiction fans, and we always welcome new additions to our fleet and new connections being made. Nobody could imagine the phenomenon Star Trek became. It’s still almost impossible to imagine. 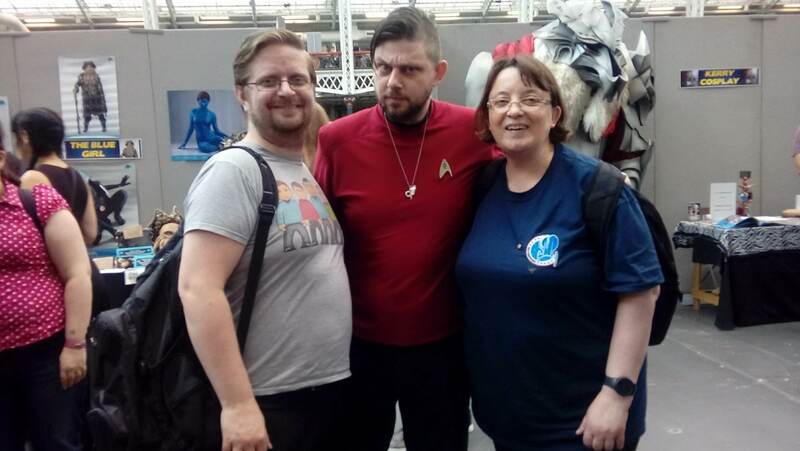 Without any shadow of doubt, Star Trek has one of the most passionate fanbases in the world, and in our time as one of the worlds longest running and most consistently active clubs we have become home to many fans from all walks of life with varied interests and personalities. By joining SFC you’ll be able to find new connections, meet life long fans with varying perspectives, find those with similar interests as yourself and be welcome to take part in any aspect of our community as a whole. Throughout the years SFC has been able to offer members new challenges, new possibilities, to appear on television and radio and much more. But most importantly, it has allowed members to make new connections and life long friends. Whether your goal is to get involved in the community, meet new people or simply enjoy our base offerings, all are welcome within the fleet and your membership is catered to your needs. By joining SFC Quadrant 2, you’ll become part of one of the longest running fan clubs in the world and gain new connections and new friendships across the UK. Aside from joining the collective of Star Trek and sci fi fans, we go to the extreme effort of ensuring we offer a full range of services and community from the club on both a local and fleet wide level. Comms: An automatic subscription to our quarterly publication, Comms, packed with sci fi news, reviews and much more. The Fleet: Access to our fleet wide community with fans of all ages and era’s coming together from across the UK. Academy: Challenge yourself and expand your knowledge to begin your path as an officer of SFC Quadrant 2. All Access: Q2 hosts groups outiwth out core structure within focusing on special interests and varied hobbies. Local Units: Make new connections and life long friends in local social gatherings with members local to you. QM Stores: Access to exclusive Q2 items and fleet discounts for vendors around the globe. Our core offerings can and will change and evolve over time, as it has done for more than forty years, to keep up with the needs of our club and the ever evolving landscape of Star Trek and the science fiction fan community. What won’t change is our continuing dedication to our members, our community and ensuring your time in the fleet is a positive one. With a rewards system based upon the world of Starfleet, we offer a system of rewards and recognition based upon it’s ranking system. Upon joining SFC you’ll be invited to join Starfleet Academy; providing insight and knowledge on the world of Starfleet and SFC. The optional four-part welcome course offers you the chance to jump straight into membership activities right away! Graduating the Academy not only offers your first promotional reward as part of SFC, but upon completion of the initial course you’ll unlock further membership rewards including assignment to a localised unit or outpost and access to our exclusive Quartermasters stores! And thats just the beginning. Becoming an officer unlocks more rewards including access to our QM stores and more, while starting your path as an active member of Q2. Ranks allow us to reward on merit; .So the member who sits back and allows SFC to run on around themor just enjoy our base offerings is less likely to see promotion than one who joins in and takes part in events and activities. In addition to the rank system we also award certificates and commendations, ensuring recognition is given wherever it is due and no one’s contributions are overlooked. If you feel you can contribute more, we also offer members the chance to pass through ‘Command Training’ and help to establish a local unit of their own and join an elite few who have taken the position of captain; a leading voice in Quadrant 2’s future. However, even with our rewards system in place, our key emphasis is on always on enjoying yourself – if you’re looking for some gold on your collar or braid on your sleeve, you’ve come to the wrong place! But if you’d like to make friends with people who share a common interest and maybe take part in the world’s foremost Fan-run Star Trek Club, then you will find a home with our fleet! A fan club with a hierarchy and rewards structure based on a fantasy military (not a military) might seem like we’re all about rules and structure. At it’s heart, Quadrant 2 believes in fun over function and utilise the fantasy as a backdrop to what we’re really about; people. Director of Communications James Tyler (centre) with Churchill officers Stephen Lester & Amanda Phillips. LFCC 2017. Upon signing up to SFC, all members are welcome to join our fleet-wide social hub, Starbase Europa, either through our forum of Facebook groups, and as you ascend through the membership ranks, gain access to further groups from internal community hubs to local social units. Since it’s inception SFC has centred around the community of the fleet and the connections we’ve made with each other over the years and coming together in being fans of Star Trek, of the wider science fiction community and meeting more like minded people across the country and every year we enjoy more coming to the collective with their unique view and personality to share our interests with. We take great pride in the friendships that have been formed over the years, our stance on equality and acceptance and above all else, our continuing mission to welcome all to a friendly and diverse group of fans. Did we mention that membership with SFC Quadrant 2 is absolutely free? With internal groups and activities, awards, unique items in our quartermasters store and more, all divisions of SFC strive to offer the very best experience to all members from being able to form new friendships and take part in local and nationwide activities. For decades SFC Quadrant 2 has taken pride in putting our connections between members first. The most important thing to all of us is bringing fans together. And unlike many other clubs, we believe fandom doesn’t come at a premium and welcome all new members to join our collective without a membership fee.